From Stromberg Carlson, a rare 2 line model 500 (575) The Model 500 came about as a replacement for the model 302 and quickly became the new workhorse of Northern and Western Electric line of telephones. In fact, dmand was so high that Western Electric had model 500's built under licence by other manufacturers such as Stromberg Carlson and Kellogg. The 500 was manufactured in many colours over the years but originally in black, brown, white, beige, blue, green, pink, and yellow. 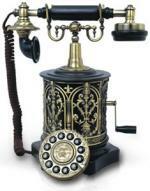 The phone hase been tested and both lines work fine. It also comes with our standard one year warranty.